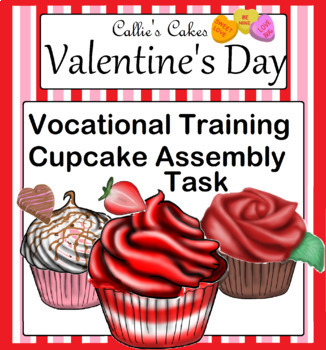 This Valentine's Day vocational task will let your student’s practice assembling cupcakes and packaging them as well! The assembly task is designed as if your student works for “Callie’s Cakes”, a fictitious cake company I’ve invented. I used to use pre-made cupcake clip art in the past, but my students just never seemed interested in assembling them. After I started creating the most juicy-mouth-watering seasonal cupcakes I could, my students were begging to complete task after task, and wondered when the next holiday theme would be brought out! This assembly task is multi-staged, so that you can offer challenges appropriate for the ability level of each student. Some students will be working on basic shape and color identification, while other students will be following through with an entire order, including simple addition. Each order form needs a base cupcake, frosting, and toppings on top. Once the cupcake is assembled, the student will package it in a printable cupcake box. For students who are ready for another challenge, an order form with pricing is included so they can determine the cost for each cupcake. With fun and yummy graphics, this assembly unit will keep your students attention while teaching them valuable job skills! 1 custom box for assembly. Also, please note that these are digital clip-art images. You will need to print them onto paper with a colored printer to get the desired colors of the cupcakes :) All images are my original artwork, and are copyrighted by Jessi Klancke.